I got really hooked on the roots and syrup combination in the past week. 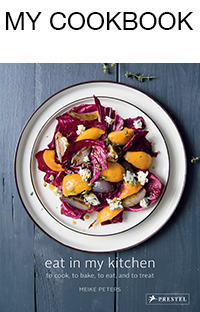 It all started with my ginger honey glazed Navet, yellow turnip fried as vegetarian steaks followed by caramelised maple parsnip with goat cheese combined in a warm salad and I’m still in the mood for sweet and earthy duos, at least one more. 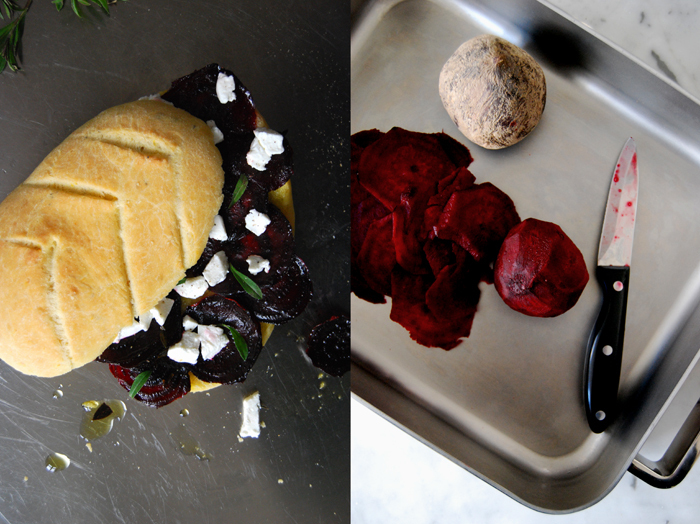 It’s Sandwich Wednesday and the first thing that came into my mind when I looked at the beautiful Fougasse bread I baked yesterday, was a baked beetroot sandwich. My flatbread has strong aromas of orange and sage, perfect to add some more earthy and sweet flavours. 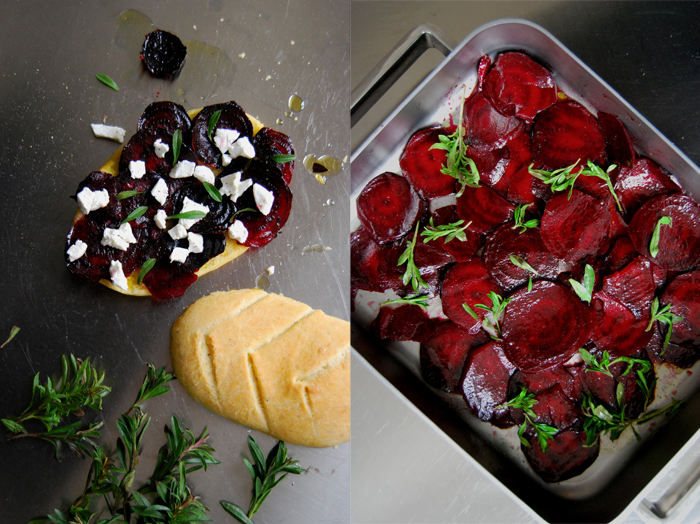 There are some beetroots lying on my kitchen window sill, just waiting to be baked in maple syrup and olive oil sprinkled with thyme. I found a kind of thyme at the organic store that I have never seen before, with thick, long leaves. They are stronger in taste compared to the small leaved one, a bit woody. 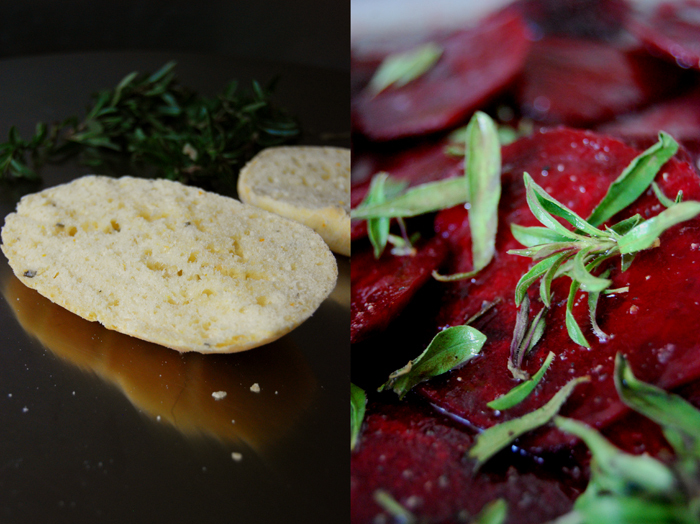 The thin slices of the roots are done after 10 minutes in the oven, soft, syrupy and partly crisp. I let them soak into the oily bread and finish my sandwich with some mild goat cheese crumbled on top to add some fresh milkiness. 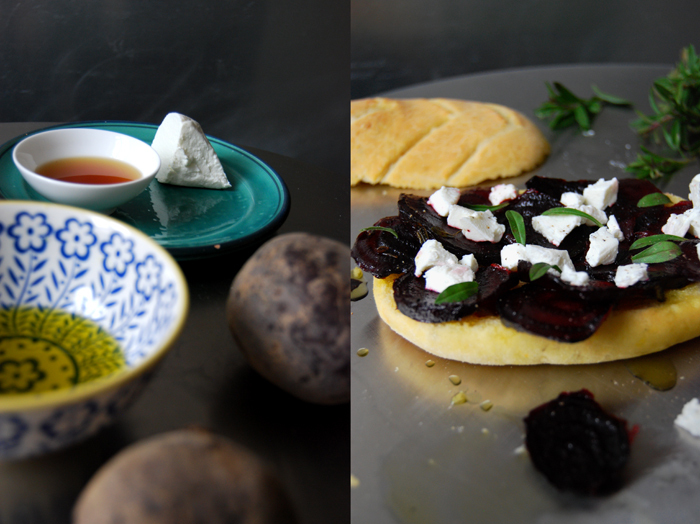 I made 3 flatbread sandwiches with 3 small beetroots peeled and cut into very thin slices and mixed with 3 tablespoons of olive oil and 2 tablespoons of maple syrup. I seasoned the roots with salt and pepper, mixed them with a few sprigs of thyme and roasted them spread in a roasting tin for 12 minutes in the hot oven set to 220°C / 430°F (Rotitherm roasting setting) until they were soft. If you don’t want to make your own Orange Sage Fougasse bread (I can just recommend it as it’s fantastic), you can also use focaccia or soft buns (I made some very soft and juicy Mountain Buns with spices a couple months ago). 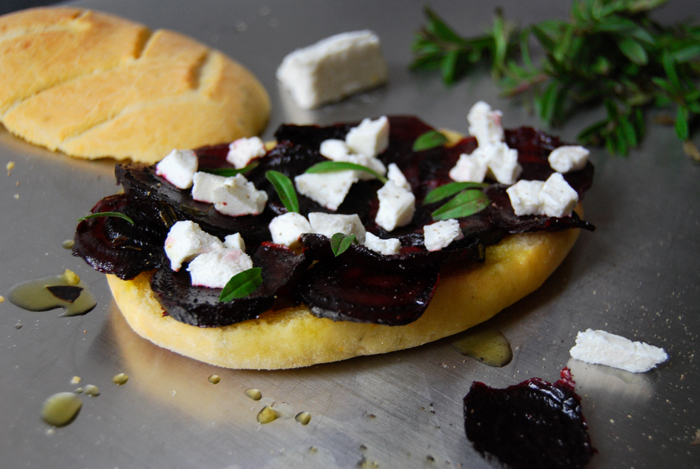 I cut the flatbread in half, drizzled some olive oil (generously) on one side and spread the roast beetroot slices on top. After I sprinkled them with goat cheese (for 3 sandwiches I used 100g / 3.5 ounces of cheese), some fresh thyme leaves, salt and pepper, I closed my Fougasse sandwich, pleased about another great sweet root variation! I just love your site, the way you cook and your pics. What a great sandwich, all my favorites! Thank you Cheri! The sandwich was so good, the syrupy roots, the goat cheese and thyme fit so well to the Fougasse.